WASHINGTON (Reuters) — The Trump administration on Thursday proposed opening nearly all U.S. offshore waters to oil and gas drilling, reversing protections in the Arctic, Atlantic, and Pacific. 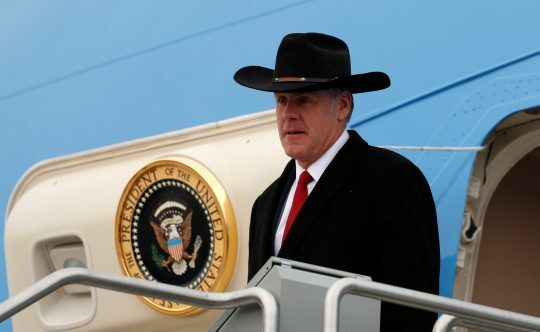 "We want to grow our nation’s offshore energy industry, instead of slowly surrendering it to foreign shores," Zinke said in prepared remarks, saying the plan is part of the Trump administration’s "American Energy Dominance" agenda. The Interior Department identified 47 potential lease sales compared with 11 under Democratic former President Barack Obama’s strategy, making it "the largest number of lease sales in U.S. history" offered in a federal five-year plan. Weeks before leaving office, Obama had banned new oil and gas drilling in federal waters in the Atlantic and Arctic oceans, protecting 115 million acres (46.5 million hectares) of waters off Alaska and 3.8 million acres (1.5 million hectares)in the Atlantic from New England to the Chesapeake Bay. A spokesman for Florida Republican Governor Rick Scott said in a statement on Wednesday that he "is aggressively fighting to protect Florida’s environment by proposing more than $3.8 billion to preserve it." "What part of the business sector are they listening to? It’s certainly not small or coastal businesses," Knapp said. This entry was posted in Issues and tagged Drilling, Trump Administration. Bookmark the permalink.